Thank you to Derik Van Beers, owner of Roscoe Ceramic Gallery in Oakland for inviting me to show with him a second time, and then waiting a whole ‘nother year for me to get it together. He says he needed to use ALL his pedestals for the first time ever; even had one more fabricated. He arranged it all so powerfully with his excellent graphic designer’s eye for grids and millimeters. I am proud to be a part of what he does. Thank you, Roger, for rattling off the basic concepts of Game Design so fast, I couldn’t read my notes. Fortunately you patiently reiterated them often. Concepts like Storyline, Motivation, Goals, Rewards, Interruptors, Visuals, and Repeatability helped me understand what the nature of good gaming comes down to, whether it be your video or my abstract strategy. Oh, and thanks for forbidding me to use the tiny googly eyes. Thank you, Cassandra, for letting me buttonhole you every time you visited to chew over the aesthetic/appearance problems of whatever game I was wrangling that month. I absolutely rely on your surefooted visual design standards. Thank you, Grace, for being my role model, cheerleader and ur-patron, and for being a jolly willing hand model, too. Thank you, Max, for that weekend of wee hours, madly working out gameplay kinks on several supposedly “done” games. It showed me that elegant functionality matters as much in games as it does in teapots. Thank you, Amy, for even more listening (OK, everyone had to listen to me…) and your curiosity, caring and sharing. Thank you, Facebook and Instagram Friends, for the witnessing and sorely needed AttaGirls as I worked through the thrills of victory and the agonies of defeat in the studio. Your love and humor kept my serotonin and dopamine levels up. Thank you, Priscilla, for being available on kinda short notice to add a whole new Games page to this website – which necessarily included a once-over for all of it – and for doing it with gusto, precision and your own creativity. 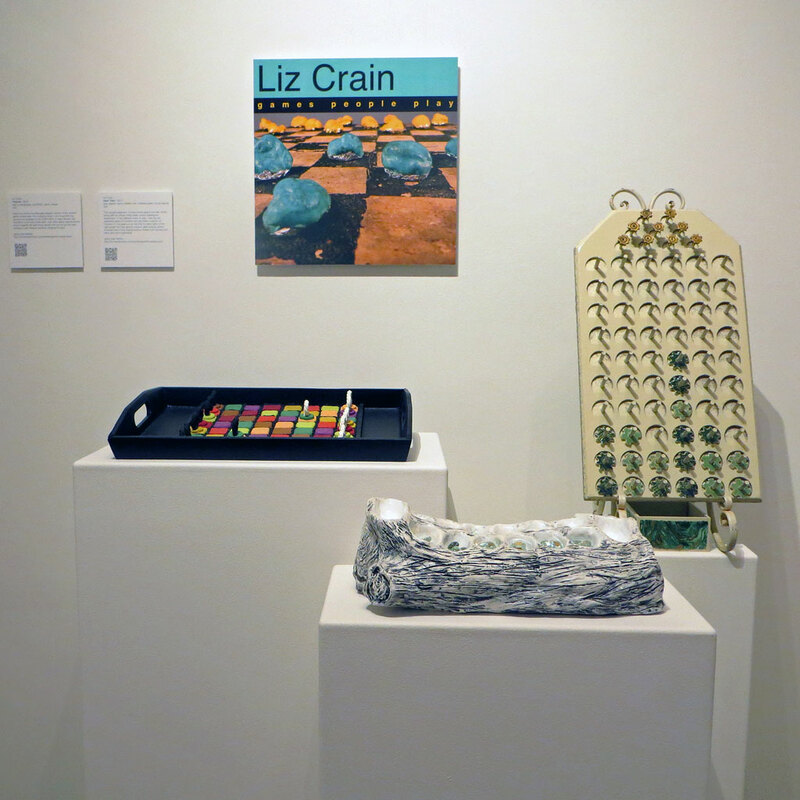 –Liz Crain, who thanks, too, all of you readers of this Studio Journal. Near or far, your following along here matters deeply and truly. I’ll be taking a short break now, but will be back with tales from the massive studio purge/remodel that I have already begun. Gracias and after a break, I’ll work on the Encore! Congratulations!! I’ve so enjoyed your posts and especially seeing a picture of the exhibit!! Your curious playful mind is the ripe cornerstone for this exhibit! Congratulations on so much concentration on multiple games and design. Whoot! It looks marvelous. And as it stands…Thanks to all your supporters too. Sweet thanks to you, too, Linda, for your support and humor over the years! Let me know if you ever come back this way and we can meet in person.